Autozone Automotive Pte Ltd – previously known as Autozone Automotive Enterprise was founded in 1995. It begins its business with importing and wholesaling of aftermarket automotive parts in Singapore. 2 years later the company further expanded its distribution network into the neighboring countries such as Malaysia, Indonesia and Brunei. With 2 decades of continuous enhancement, re-engineering and innovation, Autozone has strategizes the distribution and development of its regional domestic network. Pride to be a premier, trusted and modern regional chain store. We have developed more than 10 branches across the region namely in Malaysia, Cambodia, Myanmar, Vietnam and Thailand. These branches continued the spirit of Autozone in their various location to provide a more personalize services to their domestic customers. Placing great emphasis on customer satisfaction, we seek to create values through providing a wide range of innovative products and services. Instilling and cultivating the mindset of installers and end-user on the importance of using quality and reliable parts for safer drive. Today, Autozone is consistently involved in exploring into new regions and markets to share and expand our business model. During the last decade, we have built strong link with reputable manufacturers and leading principals to enable us to distribute comprehensive range of renown brands such as REMSA, FERODO, NISSHINBO & JFBK Brakes, DAIDO, TAIHO & NDC Engine Bearings, MAHLE IZUMI Liner Kits, FUJI OOZX & DOKURO Engine Valves, RIK Piston Rings, TOYO U-Joint, WAGNER & FLOSSER Sealed Beam and Bulbs, SANKEI & GEN Electrical parts, NWB wiper blades, VIC & HENGST Filters, TBK, JKC, KNORR parts, DEPO & DOSSUN Body Parts and etc. Since 2002, we have also built our house brands such as REV-1 for Lubricants, VETTO for Brake’s product, SUNBLADE for Wiper products, FILTEQ for Filters, ENERGEO for automotive Batteries & Electrical Parts, NUTEQ for Steering and Suspension Parts, GENTEQ for Pumps and Cooling System Parts, ELITO for Cable and Hoses. All these brands are being trademark and registered in Singapore and Internationally. These products are carefully chosen and are produced by reliable manufacturers who are ISO, QS or TUV certified and its quality meets or exceeds Original Equipment Standards. 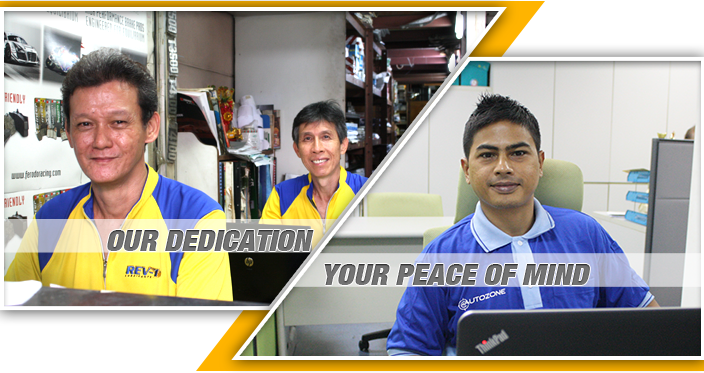 We deliver "peace of mind" and customers can be assured of the consistent high quality in the parts we distribute. More superior products will be launch in the next couple of years to further expand the position with our valued customers. With our dedicated staff working solidly behind us, we are confident of greater heights for the company in the near future. Autozone invites interested business associates and valued customers to join forces and move forward together.